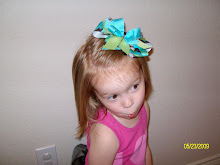 Okay, so I have been a horrible blogger lately!!! But I'd rather take the time to enjoy special moments with the kiddos and if I don't have time to blog about them then that's okay. 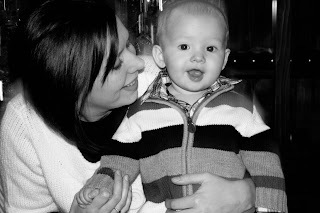 This is one of my absolute favorite pictures of me and my little monkey. He is getting so big these days. Here is an update: He is army crawling everywhere. He still won't pick his belly up off the ground but whatever, I guess that's not his style. He loves to crawl across the living room to get anything that Mayson is playing with which thoroughly ticks her off :) He also shakes his head and growls at us! Daddy taught him this and they both think it's hilarious. He loves taking baths, hates having his diaper changed, has discovered Puffs (one of his sisters favorites) and loves to throw and hit anything. Typical boy! He is so much fun and is such a blessing. He says mama, dada, ba (bottle), he waves bye-bye and claps his hands. This was a special day for Mayson. 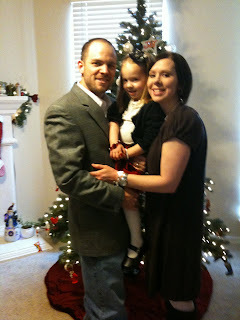 We took her to see The Nutcracker at Will Rogers that her ballet company put on. She loved it. 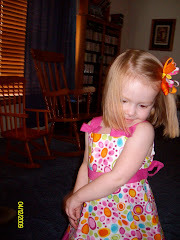 I think she liked getting dressed up and putting on her special jewelry more than the actual ballet but whatever. It was a special time for her to get to spend one on one with mommy and daddy. Her showing off her jewelry! 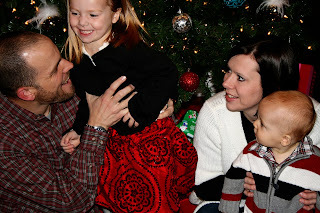 These were some family pics we did for Christmas. Thank you Traci for taking these for us. This was a funny one of the fam. Love them!!!!! 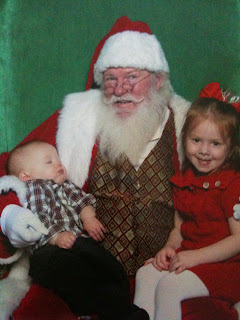 And this was the kids picture with Santa. 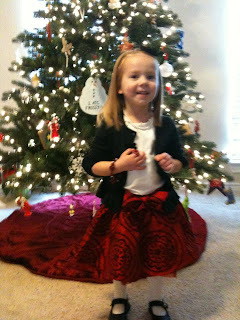 Mayson was so excited this year and was such a big girl. She got right up on Santas lap and told him what she wanted for Christmas, an "earring factory?!?!" She doesn't even have her ears pierced. Graham slept through the whole thing. Sweet boy, I guess it's better than him crying. All in all it's been a great Christmas season! Very busy but I guess that's how it goes with 2 young kids. Happy Holidays to everyone. Hope you have a blessed 2010! Katy! Good to hear from you! Oh my goodness Blake didn't even crawl until 10 months and didn't walk until 16 months. It was SO annoying. So to me, Kylie is speeding right through the milestones. I would freak out if she started walking right now, we are not exactly living in a baby proof environment.